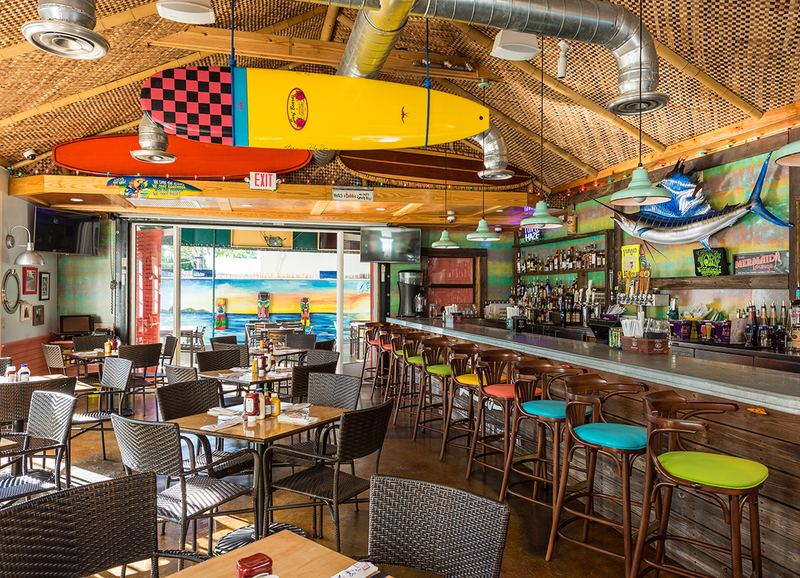 Florida Keys: Enjoy Dinner at Lucy’s Retired Surfers Bar & Restaurant! 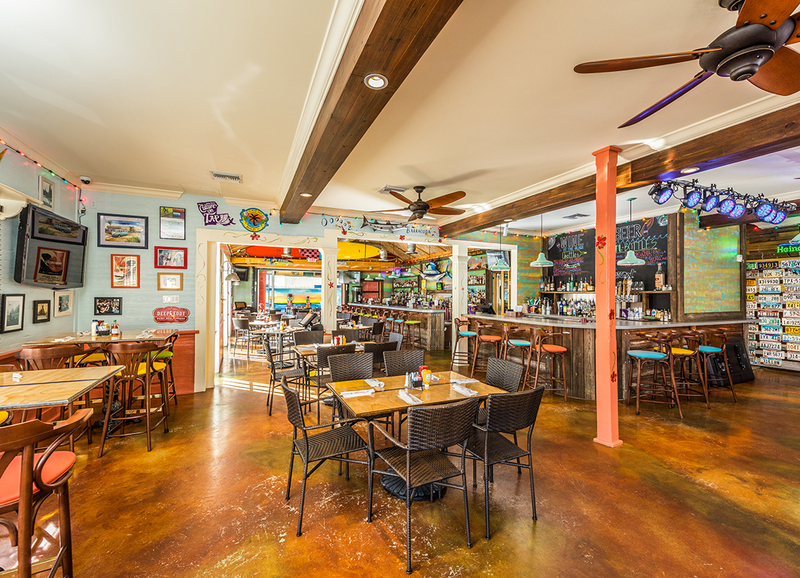 Florida Keys: Enjoy Dinner at Lucy’s Key West Retired Surfers Bar & Restaurant! Disclosure: Our food was covered by Lucy’s Retired Surfers Bar & Restaurant and The Florida Keys. All opinions are my own. It’s tough not to remember the devastation Hurricane Irma caused when it reached landfall in Cudjoe Key on September 10th, 2017 as a Category 4 hurricane. 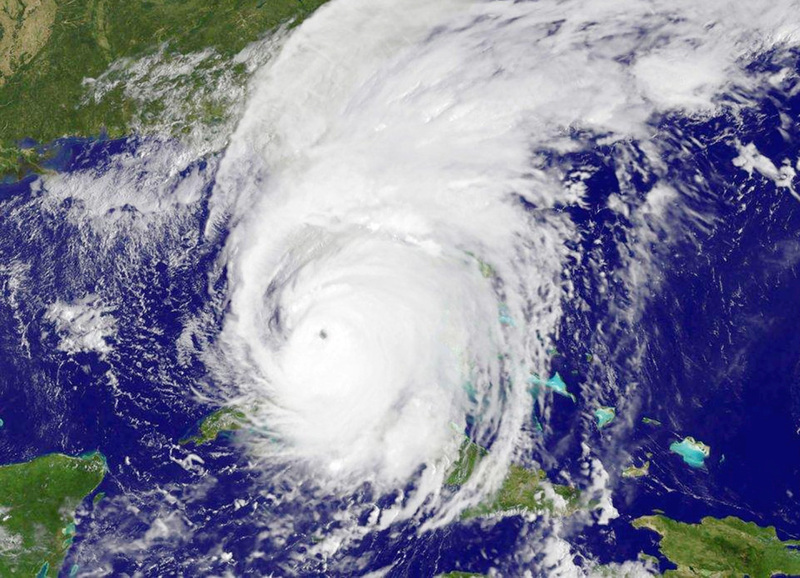 Florida Governor Rick Scott declared a state of emergency on September 4th, and placed 100 members of the Florida National Guard on duty to assist with emergency preparations. Tolls on all toll roads in Florida were suspended. Airports, Disney World, Universal Studios, SeaWorld Orlando, Kennedy Space Center, and southern Florida seaports… all closed. Sporting events were cancelled. School, public buildings, and businesses… closed. A record 6.5 million Floridians evacuated. When Hurricane Irma passed, it was time to return and rebuild. Florida came together to clean up the destruction and mess Irma left behind. USS Iwo Jima, USS New York, and USS Abraham Lincoln were sent to the Florida Keys for recovery assistance. By September 17th, the Overseas Highway was repaired, opened, and residents were able to return to their homes. On the Friday after they were able to return, Lucy’s Retired Surfers Bar and Restaurant served at least 1,000 free meals, and celebrated their first year in Key West. Like a lot of people, I watched from afar the destruction that the Florida Keys endured, and was overjoyed to see them all come together to rebuild. A few months later, I was going to be visiting the Florida Keys on a press trip. Lucy’s Retired Surfer’s Bar and Restaurant was scheduled to be one of the restaurants we were to have dinner at while in Key West… the same restaurant that helped feed residents and helpers during a very difficult time last Fall. By the time I visited in March 2018, there were little to no signs a hurricane had ever come through. Florida cleaned, rebuilt, reopened, and went back to their relaxed lifestyle. 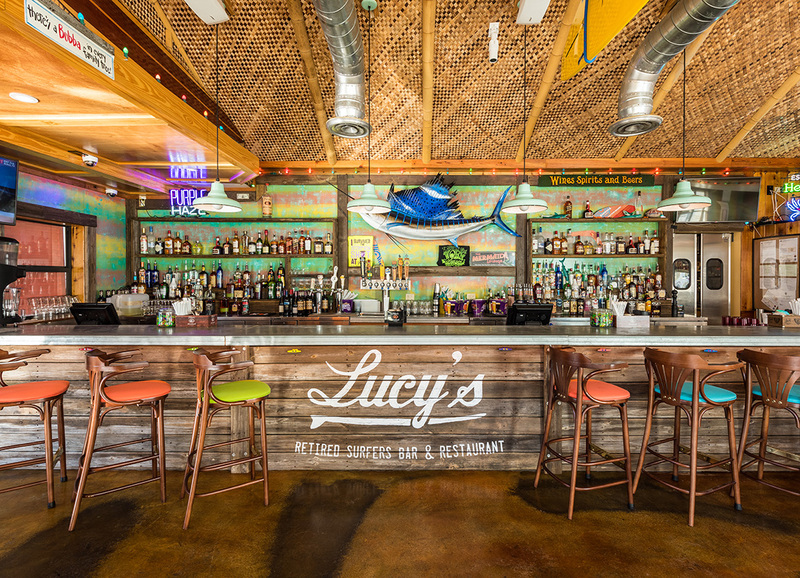 With a coastal fusion menu inspired by surfing spots all over the world, and decor to match, Lucy’s Retired Surfers Bar & Restaurant is one of Key West’s newest hot spots. You can either dine in the main bar area, or outside on their covered and lit patio. The music is playing, the drinks are flowing, and the fun times are awaiting you. Cowabunga dude… get in there! Yep, you read that right. Lucy’s Retired Surfers Bar & Restaurant is pet friendly… and not just service animals. You can bring your pooch with you into the restaurant or bar. They even have a special Sur-Fur menu for your furkids! 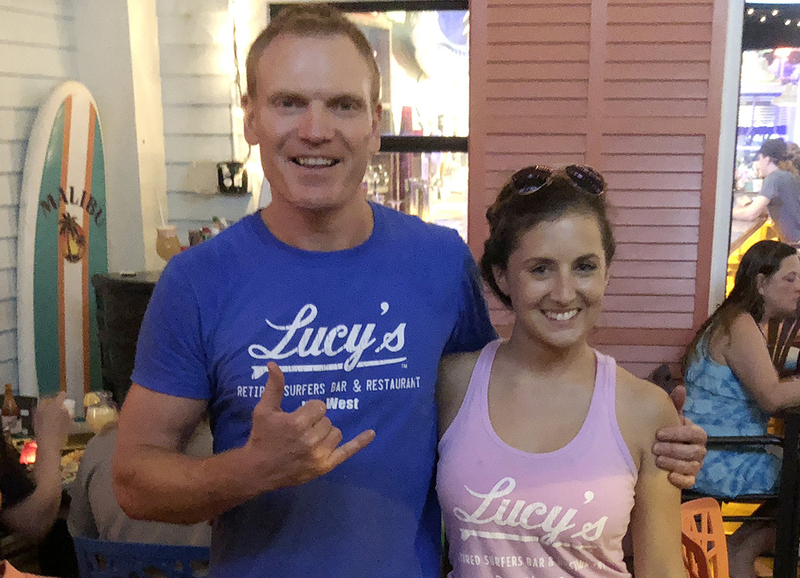 Managers Scott Taylor and Jessica Ormiston wanted to give us a taste of what Tuesdays were like at Lucy’s Retired Surfers Bar & Restaurant. It was taco Tuesdays after all! We got to try so many of Lucy’s popular dishes. It was truly an amazing meal. I say appetizers, because we had a few, and shared family style amongst the group. The first dish brought out was the popular Sunset Shrimp Salad. Pineapple, mango, red onion, cabbage, avocado, cucumber, A leafy green spring mix, topped with pineapple, mango, red onion, cabbage, avocado, cucumber, and tossed in a honey Key lime vinaigrette dressing… and a few lovely Key Lime pink shrimp on top. 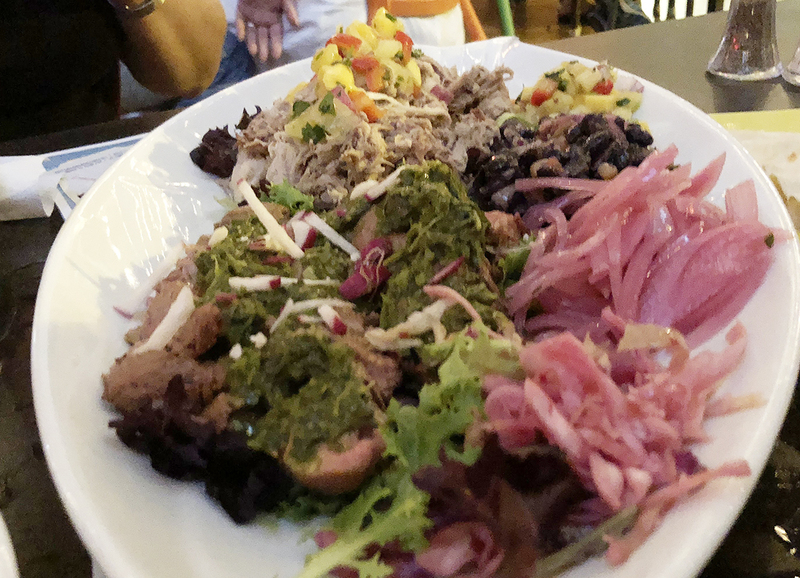 A great salad to share, and a good way to start your meal. Our second appetizer was Lucy’s PEI Beer Braised Mussels, simmered in a crisp ale with smoked sausage, garlic, capers, and tomato, all topped with a manchego cheese and buttered crostini. If you are fan of mussels, you will love this combination. The last appetizer brought out was my favourite – the Avocado Fritas. Oh man, I never thought I would love avocado as much as I did. Beer battered avocado topped with black bean salad and chipotle ranch to dip. I had way more of this than I care to admit… it was that good! With all of the appetizers we inhaled, I was starting to slow down a bit, not realizing what was still to come. Our first main course dish was Jamaican Jerk Chicken. It was served on a bed of island rice with black beans, fried plantains, and Pali sauce. So good, and just the right amount of kick! Out came a second platter with shredded beef and carnitas. I love fish tacos and all, but the minute the shredded beef and carnitas came out, I switched over. They were both super tender, and spiced just right. When the Key Lime Mousse was brought to the table, I listened carefully to the ingredients. A light and fluffy Key lime mousse, layered with house made whipped cream and crushed pistachios. Oh my gosh… the combination of flavours in this bad boy is incredible! I didn’t know how well the pistachios would do, but they blended in perfectly, and offered a mild crunch within this creamy mousse dessert. Save room, and give this light dessert a go by yourself! Our second dessert was a decadent Chocolate Bread Pudding, served with a house made whipped cream. It was a very large portion, so I highly recommend one dessert, and two spoons… this one is shareable folks! Lucy’s Retired Surfers Bar & Restaurant is well known for their unique cocktails. I did try a few including the famous Shark Attack, but my favourite was this refreshing Mango Margarita. Smooth, cold, and delicious! There is something on the menu at Lucy’s Retired Surfers Bar & Restaurant to please everyone’s appetite. From fresh fish to juicy burgers, there is a lot to choose from! • Housemate Granola with Yogurt & Fruit: Hearty granola, served with yogurt and seasonal fresh fruit. • Pain Perdu: Served with pineapple maple syrup. • The Dewey Weber Breakfast Platter: 2 eggs any style with bacon, ham or sausage, served with your choice of home fries, grits or grilled sliced tomatoes. Toast, biscuit or English muffin. • Cabo Shrimp & Grits: Seared tail-on shrimp, served over pepper jack cheese grits, topped with honey jalapeño butter sauce. • Whitey Harrison Huevis Ranchero: Two corn tortillas topped with black beans, two fried eggs, salsa, melted cheese, ranchero sauce, and green onions. • BBQ Pulled Pork Hash: Sweet and savory pulled pork with sautéed red potatoes, bell peppers, onions and jalapeño topped with two friend eggs and chipotle ranch. • Santa Cruz: Three scrambled eggs with cheese, sausage, bacon, ham. grilled onions and tomato, topped with sour cream and salsa. Served with home fries. • The Tom Blake Benedict: Two poached eggs on toasted English muffin with grilled ham, fresh avocado and grilled tomato topped with hollandaise sauce. • Eggs Montere: Blackened fish topped with two poached eggs, creole hollandaise, served with blackened tomato. • Steak & Eggs: Marinated flank steak served with two eggs any style, caramelized onions, chimichurri sauce, and your choice of side. • Lucy’s Homemade Chips & Salsa: Lucy’s classic salsa, made fresh daily. • Lucy’s Rock-a-Mole: Our awesome made in house guacamole sprinkled with quest fresco crumbles, served with handmade chips. • Sue’s Queso Banco: Spicy blend of melted cheeses, tomatoes and Sue’s secret spice to give it a kick. • Tropical Pork Sliders: Two BBQ pulled pork sliders, dressed with tropical slaw and chipotle ranch on mini brioche buns. • Rip Curl Calamari: Crispy fried calamari tossed in sweet Thai child sauce. • Shaka Ceviche: Fresh local fish on a citrus marinade garnished with avocado, red onion, poblano pepper, colinatro and red bull pepper, served with tortilla chips. • Serious Nachos: Tortilla chips piled high, topped with back beans, shredded cheese, pico de gallo, sour cream, and rocking’ guacamole, layered with Sue’s queso. • Avocado Fritas: Beer battered avocado topped with black bean salad and chipotle ranch. • Mi Casa, So Casa: Romaine and spring mix, tomatoes, carrots, and cucumber with homemade croutons. Add grilled chicken, grilled/fried shrimp, or steak. • Cloud break Cobb Salad: Mixed greens topped with ham, turkey, bacon, manchego cheese, egg, red onion, tomato and avocado, served with choice of dressing on the side. • Rippin’ California Caesar: Romaine hearts, homemade croutons and manchego cheese, tossed in a creamy homemade Caesar dressing. Add grilled chicken, grilled/fried shrimp, or steak. 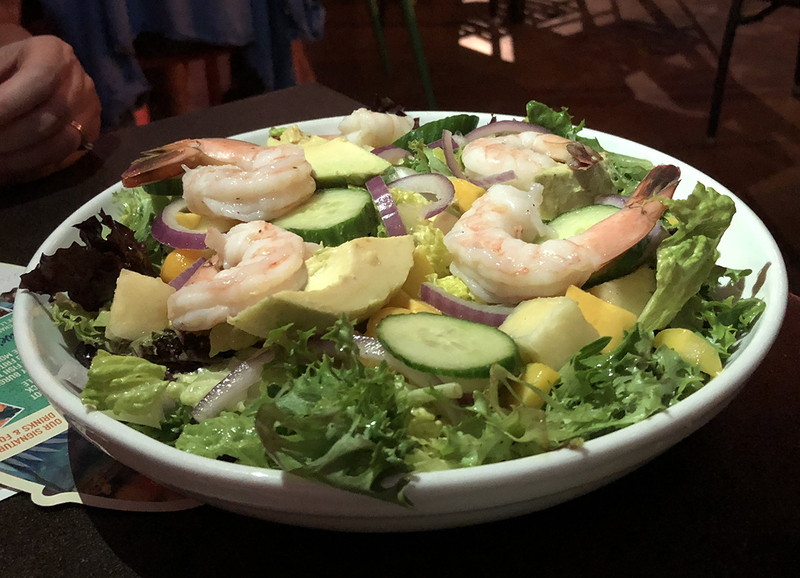 • Sunset Shrimp Salad: Boiled shrimp, pineapple, mango, red onion, cabbage, avocado and cucumber, served on top of a spring mix, tossed with a honey Key lime vinaigrette dressing. Every Tuesday, it’s $1 soft beef tacos at Lucy’s! • Blackened Fish Tacos: Blackened local fish with pineapple cabbage slaw and avocado cream. • Pao Pao Shrimp: Fried shrimp tossed in a sassy pao pao sauce, topped with cabbage slaw and cilantro. • Pork Carnitas: Citrus-marinated slow roasted pork dressed with mango pineapple salsa and quest fresco. • Flank Steak: Thin sliced flank steak with house made chimichurri, shaved radish and pickled red onion. • The Juicy Lucy: Our famous 8oz burger, tomato, lettuce, onion and pickles with Lucy’s special sauce. • Bacon Brie Chicken Sandwich: Grilled marinated sliced chicken breast topped with crisp bacon, brie, tomato, spinach, and creole honey mustard, served on a brioche bun. • The Valley Girl Club: Lucy’s triple decker club with smoked turkey, ham, bacon, and Swiss cheese plus sprouts, cucumbers, avocado, lettuce and tomato on toasted wheat berry bread with chipotle ranch dressing. • Mahi Mahi Sandwich: Mahi filet, grilled and toped with avocado crema and cabbage slaw, served on a bun. • The 1968: Grilled zucchini, squash, portobello mushrooms, tomatoes, spinach, and salsa verde served on tasted wheat berry bread. • Fish Po’Boy: Locally caught and flash fried fish rested with lettuce, tomato, pickles, and mayonnaise. • Shrimp Po’Boy: Fried shrimp, dressed with lettuce, tomato, pickles, and mayonnaise. 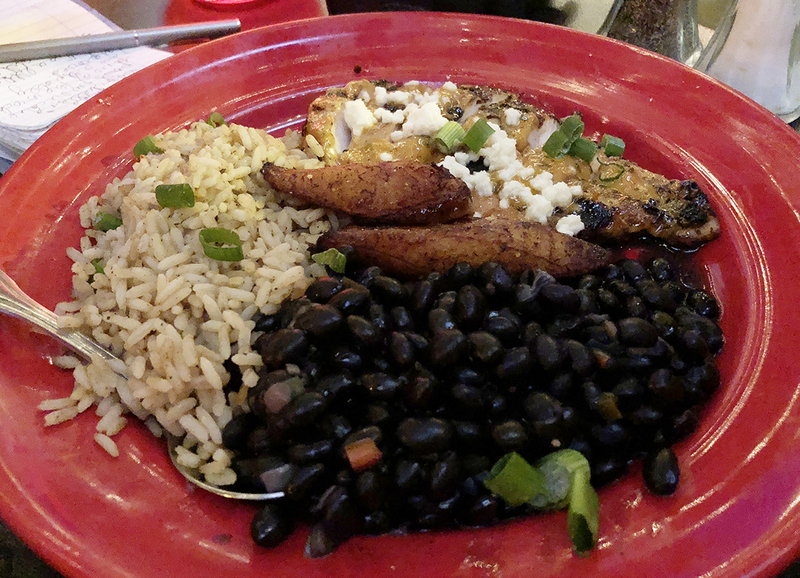 • Jamaican Jerked Chicken: Served with island rice, black beans, fried plantains, and Pali sauce. • Catch Of The Day: Local fresh caught fish, served with island rice, seasonal vegetables, and a citrus butter sauce. 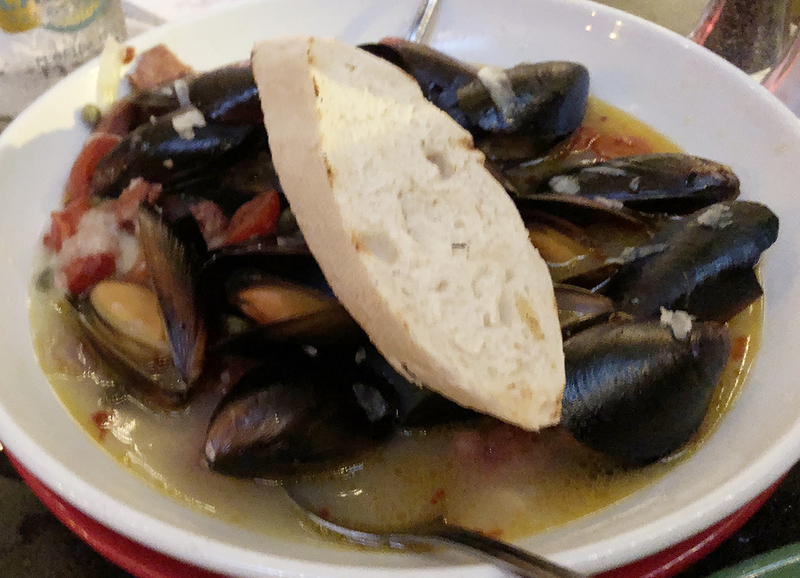 • Beer Braised Mussels: PEI mussels simmered in a crisp ale with smoked sausage, garlic, capers, and tomato, topped with manchego cheese and buttered crostini. • Bonfire Churrasco Steak: Marinated flank steak with red potatoes and seasonal vegetables. 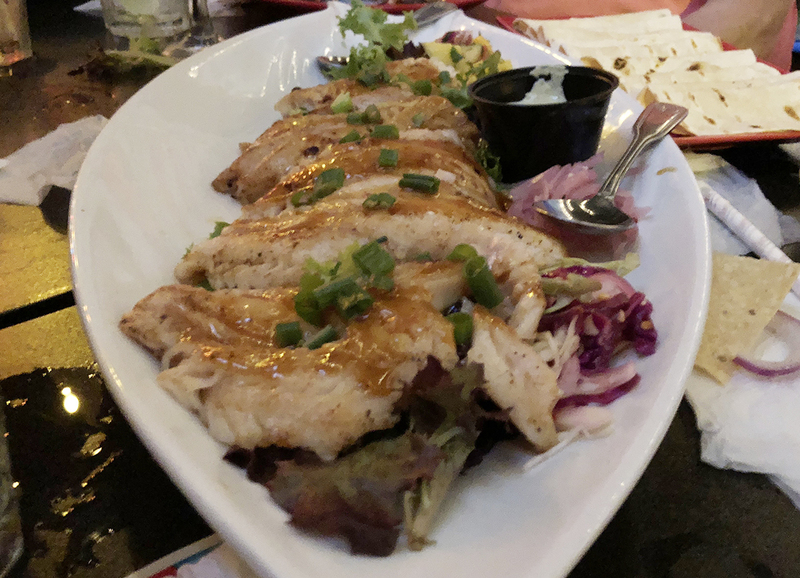 • Ohana Whole Fish Tacos: Locally caught grilled whole fish served family style with tortillas, salsa, house made slaw, black bean salad, mango salsa, and pickled red onion. 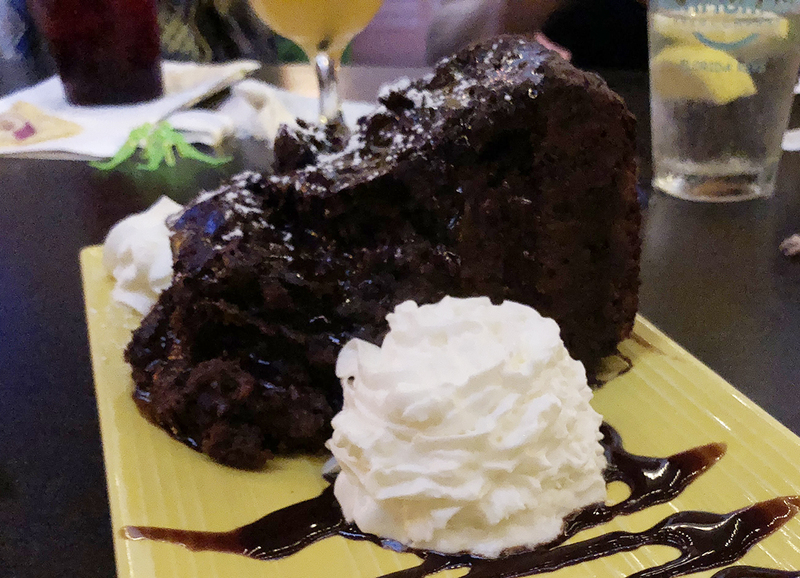 • Chocolate Bread Pudding: Decedent bread pudding served with a house made whipped cream. • Flamingo Crossing Ice Cream: Two scoops of locally made ice cream. • Key Lime Mousse: Light and fluffy Key lime mousse, layered with house made whipped cream and crushed pistachios. Not a complete list, but these are some popular favourites! • Shark Attack: Includes an 11” shark, vodka, gin, tequila, sour, and the blood of its victims. • Bloody Marys: Made with locally-owned Bombora Vodka. • Lil’ Shark Attack: Kid friendly! Includes an 11” shark and the blood of its victims. • Beer and Wine: Lots of beer available in bottles or draft, and a great selection of wine available by the glass, bottle, or on tap. Also not a compete list, but these will get people talking! • Worm Shot: Tequila, potentially hallucinogenic worm, a t-shirt and bragging rights. • Infamous Scorpion Shot: The sting is the thing! Courage, possibly venomous scorpion, tequila, a t-shirt, and 1 helluva story! You Catch ‘Em, Lucy’s Will Cook ‘Em! If you have been out charter fishing, and you reeled in that awesome catch, or a massive lobster, bring it in to Lucy’s. They will cook it up for you any way you want. How’s that for service? 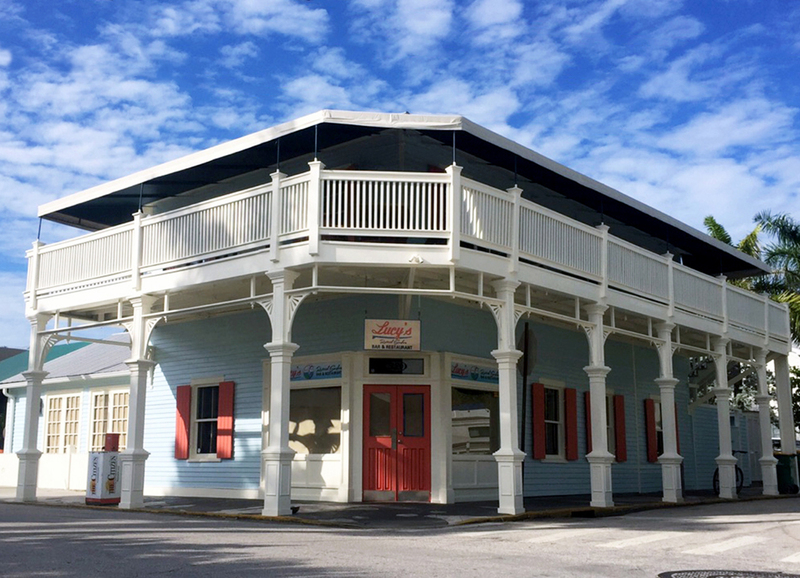 You can follow Lucy’s Retired Surfers Bar & Restaurant Key West location on Facebook, Instagram, and Twitter. That food looks and sounds amazing, I shouldn’t have read this while hungry. Rookie mistake! What an amazing story they have. And the menu looks like I would have a hard time choosing what to eat everything sounds great!